I’m waiting for a ton of parts and consumables to arrive for the Ranger and M3, but I had a hankering to do something tonight. 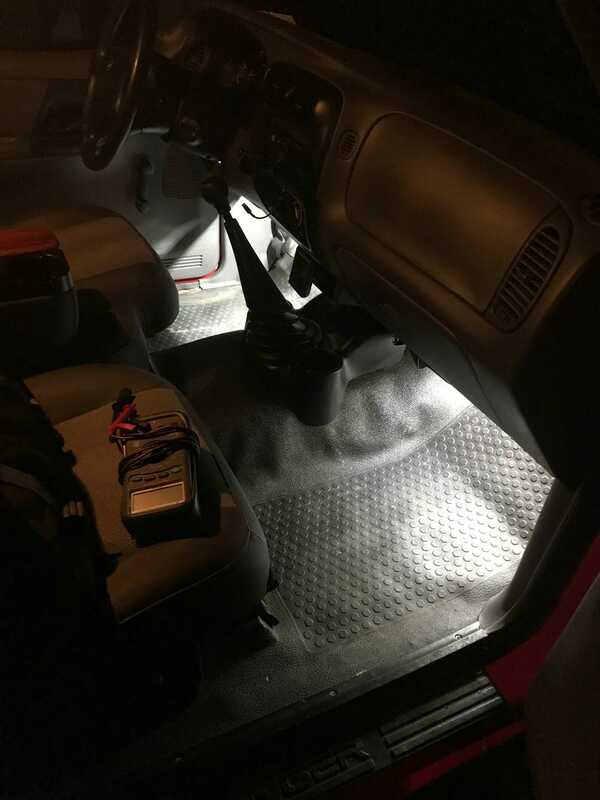 So I took a bunch of cheap LED bars that I have and wired up some footwell lights. I wired the relay so that they come on when the truck is unlocked, a door is opened, or when you turn on the interior lights. I plan to do another in the back of the cab, and I have an LED replacement for the dome light on order so that everything is the same color. I took care of the glove box light too. I was getting ready to pack up when I found a hood pin switch from my car stereo install days. So I wired up a light in the engine bay too. I still have to loom all of the wires, but it turns on when I open the hood and it’s crazy bright.